HP 41CX Emulator written by Warren Furlow (Release 7B). Update December 2011: There is an installation problem on Windows 7. We have repackage it into a simple zip file below. Open the zip file and drop the "V41" into any location. 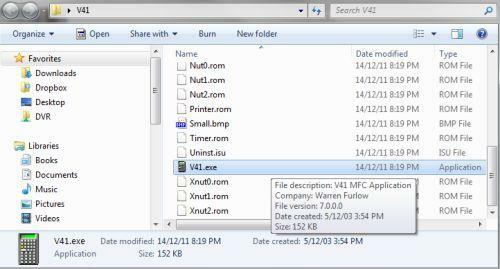 Then navigate into the "V41" folder and double click "V41.exe". Is there a way to download programs like the old insert chips? Is this emulator compatible with Windows 10? Would love to have an HP41CV app for my Android tablet. HP 41CX, fantastic program. I have an original without batteries. I buy! Please say the price. Super, vielen Dank, das war mein bester Rechner HP41, HB41c und HP41CX im Gymnasium und im Studium in den 80 Jahren. Brauche den heute immer noch nach bald 40 Jahren. Beste Grüsse aus St. Moritz und Zürich. I also used this calculator in back then! I thought that I remember that you get 2040 when you do this, however, using an emulator, this doesn&apos;t work. I am in discussion about this with James Thomson who wrote PCalc for iOs, which I use as my HP41 replacement (for simple calculations). Your answer would really help me. Additionally: a right click into the display showing an error code gives additional explanation of the error cause. Is there a chance to implement such additional information into your emulator? Wow! is there a linux version of it? memory lost shows in the display each time I open the emulator to use it. Is there a remedy for this? Same here on Windows 7 but, not on XP, I expect this is a permissions issue - anyone have a work-around ? I think this is an access privileges issue if you install it into the standard program files directory tree, like "C:\Program Files (x86)" . I install it into a directory named "D:\UAC_OK\V41" where I have several programs that run into UAC issues, and V41 runs fine in this directory. I multiplied 11,000,000 x 2,000 This gave me a result of 2.200 did not give indication of (to the 10th). My portable emulator works. Please look into it. Thanks. Otherwise great computer application. This is a display problem: go to "Options", select "Medium" (correct answer should appear), then select "Large" (again). Correct answer should remain, but with a slightly smaller font (than start-up) now. I recently upgraded to Windows 10, but honestly I don&apos;t remember how it behaved before. Is it possible to import, export programs via csv files? It appears it is not possible. Is this a bug that can be fixed?